If you have ever needed to replace a single word or an HTML string with a different word on a WordPress website, then you need a search and replace tool. A search and replace tool is a quick way to find text and replace it online without making major changes to your website. These search and replace tools are a great to make quick fixes on your WordPress site. Some of these tools are making this fixes within the WordPress database and some are making this fixes in real time. Real time search and replace means that text can be found and replace on the fly whenever it’s needed without making database changes so you can always revert back to the original. Database search and replace changes are permanent, since the database cannot be reverted after it’s been changed unless of course you have continues backups. The following plugins are the best options for anyone looking for a feature rich search and replace tool for WordPress. The CM Search & Replace plugin for WordPress is an excellent options that lets users make changes to any page or post before it’s displayed. This helpful tool replaces content without making changes to the WordPress database. This affordable plugin also features time based search and replace support, rule set management, import and export rules, and much more. It can also support HTML search and replace within the content of your site pages. In addition, the pro version features applying search and replace rules on certain dates, regex search and searching terms by content type. This plugin lets users easily replace domains, content or html. The Search & Replace plugin lets users easily search and replace data in the database. In addition to being able to search and replace everything, this plugin allows users to do a full database backup and restore it if necessary. This customizable plugin is ideal for both users and developers. This plugin offers the quick and easy domain and url replacing, so it’s very quick to transfer a WordPress site. This plugin has excellent support and includes localization. 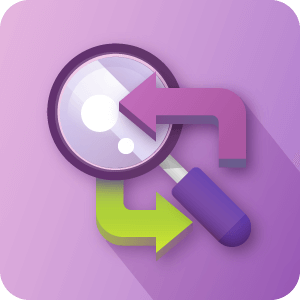 Better Search Replace is a simple search and replace plugin that lets users can the database for problems quickly and efficiently. 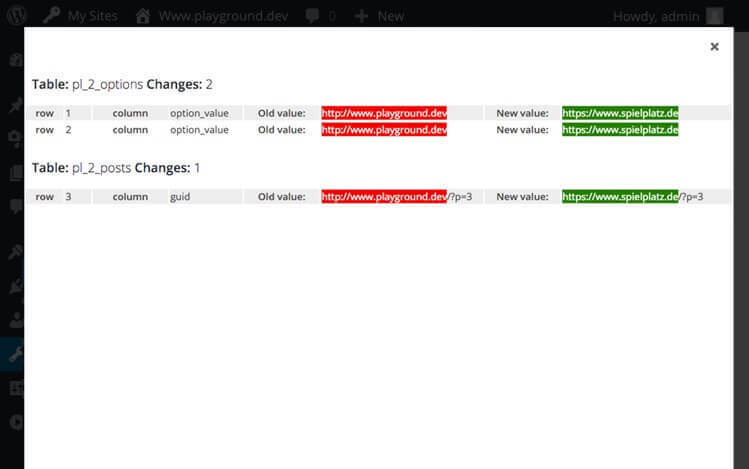 The plugin includes a dry run feature for users to view the changes that will be made. This plugin includes great support and was recently updated. The pro version of Better Search Replace lets users backup and import the database while changes are made. Also, users can save custom profiles to repeat search and replace in the future easily. Users also get full updates and support for a year as well as priority email support. Search Regex exists to make website migration and upgrading easier for the user. This plugin performs high quality search and replace functions in WordPress beyond standard search capabilities. The plugin also supports localization. The Search Regex plugin is ideal for businesses looking to upgrade or change their directories with no hassle. The plugin lets users easily search and replace urls and content in mass quantities. 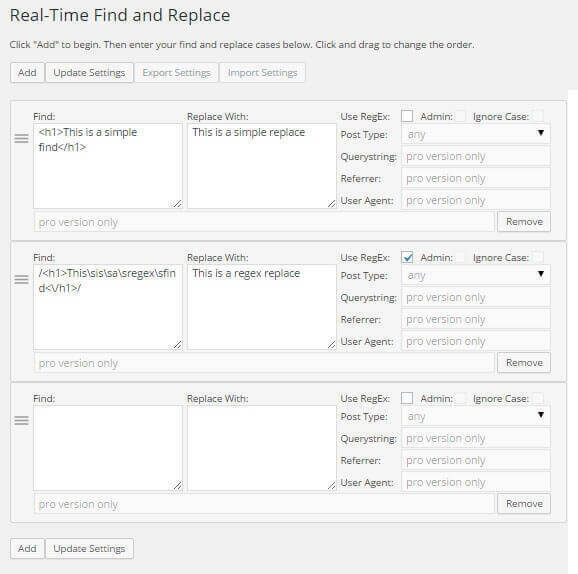 The Real Time Find & Replace plugin lets users implement find and replace rules after a page has been generated by WordPress, but before it’s sent to a users browser. These changes occur in real time so changes to themes and plugins are not necessary. This makes updating and upgrading pages and products go a lot smoother. This plugin features a pro version with the ability for users to modify admin pages. Also, users have access to additional filtering options and controlling the import and export functionalities. All of these search and replace tools have helpful features, the key is to find the tool which works the best for your business. Here is a comparison of some of the top features. There are several great tools for search and replace out there, and each of them have helpful features depending on what the user wants to accomplish. All of these plugins are capable of easily fixing content on a WordPress site, whether it’s on the fly or within the WordPress database. The on demand search and replace tool allows you to easily replace texts & html in all types of posts and pages including theme & plugins generated content. 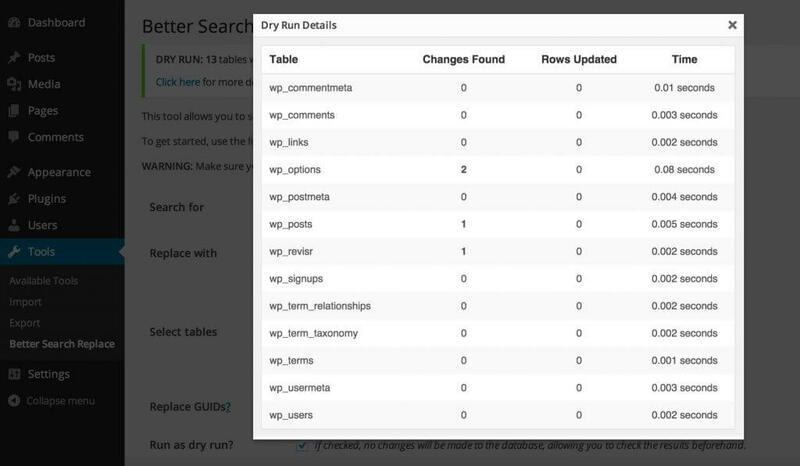 Easily search and replace changes while maintaining control of your WordPress database. In conclusion, users can determine which search and replace tool would be most effective for their business. The search and replace tool quickly fixes content in a website including text files, urls, html and more. Many of these plugins have customizable features and have pro versions with advanced find and replace features.